Wedding rituals have been around since the begin­ning of time. But, wed­ding trends come and go. New, eye-popping trends inspired by social media, Hollywood and the Middle East are emerging for 2019 and the Chaldean community is em­bracing them, customizing them and taking them to exciting new levels. 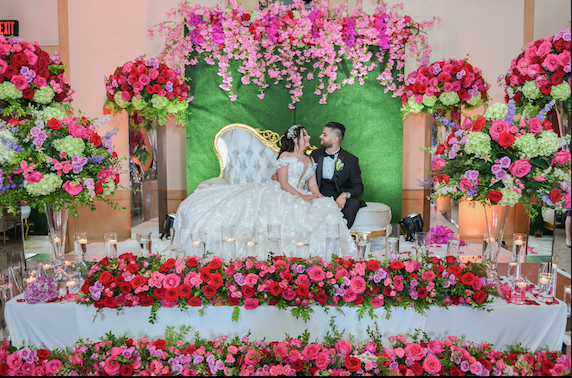 Dalia Atisha is an event planner/ designer and owner of The Event Planner Inc.
Suhair Kallabat is also an event planner, designer and owner of Eventfully Yours. Both women have decades of ex­perience in planning events between them, thousands of events under their belts and have seen wedding trends come and go. But, of course, they always have and eye on the future. “Social media and Hollywood are the biggest influences on weddings these days. People are really looking for that wow factor. For example, a couple will see a wedding on social media from Hollywood or Dubai where the sky is the limit and they want to bring that here to their own customized wed­ding,” explained Atisha. “Dubai, Hollywood and the Leba­nese influences are very big right now, they tend to do things really grandiose, exotic and beautiful and that’s really influencing people here. It’s really fun,” Kallabat added. Speaking of the sky, a new and emerg­ing wedding reception trend is flow­ers, crystals and specialty LED light­ing that are hung from the ceiling. “Some are even hanging an entire floral centerpiece from the ceiling,” she added. Nothing says love like fireworks! For 2019, Chaldeans are incorporating them, both indoors and out, for a jaw dropping, visual effect. “Smokeless, odorless, fireworks are being brought indoors for the couple’s first dance along with smoke machines. So, it looks like you’re dancing on a cloud. It’s about trans­forming the venue from a simple ballroom into something special with a beautiful, customized ambi­ance.” said Kallabat. Some couples also are choosing to end their most special day with a fire­works display outdoors (weather and municipally permitting). Banquet hall dance floors are being transformed into club-like atmo­spheres complete with smoke ma­chines and specialty lighting. “The lighted, bright dance floor is a big trend with LED lights and all of the technical stuff like robotic lights. It’s all about lights, camera, action Hollywood stuff. It’s all very influenced by what’s happening in Dubai and on social media,” Atisha explained. Many couples are opting for both a band and a deejay to cover the tradi­tional songs and new dance club hits to keep the mood festive and their guests moving. “There is almost always a band to play Chaldean music and the Deejay does the American music to cover all the bases,” said Kallabat. “A lot of Chaldean bands actually come with a deejay for this reason,” added Atisha. Aside from emulating celebrity wed­dings featured on social media, Hol­lywood classic movie themes are also a hot trend. “Some couples are going for that storybook feel and trying to bring romantic movies like ‘Casablanca’ and ‘Gone with the Wind’ to life and bring bringing the past into today,” Atisha said. Much like Hollywood award shows, costume changes between the cere­mony and reception are becoming a trend for both the bride and groom. “Detachable dresses are a big trend so that brides can go from a ballroom dress for the ceremony to mermaid style for the reception with the same dress. The grooms are even changing up their jackets from a formal, black jacket for the ceremony to a more versatile, blue jacket or white ensemble for the re­ception,” explained Kallabat. Traditional ‘matchy-matchy’ ivo­ry, champagne and white color schemes are being replaced with the bold and it’s beautiful. “Dark and edgy colors are emerg­ing as a big trend. Couples are mix­ing it up with the blacks, reds and fuchsias and mixing with jewel tones instead of your traditional, romantic blush tones. People are even starting to mix and match metals like rose gold and silvers in their candelabras and centerpieces. It all looks really good together,” said Kallabat. The days of sit down, wedding recep­tion dinners with the same old meals and simple desert tables are on the outs. The newest trend is to have many, interactive food stations. “We’re moving past the tradi­tional, sit down, plated dinners. A lot of couples are opting for roaming dinners with carving stations, sushi, pasta, guacamole and ice cream bars. I’ve found that the younger couples want more people interacting, mov­ing around and sampling this and that,” Kallabat explained. Wedding cakes are turning from a pretty side notes to sculpted, works of art that sometimes stretch to the ceiling. “They really are sculptures now. I recently organized a wedding where the cake was designed to look like a strand of pearls with big round balls graduated upward. They are being used as a big statement piece and focal point sometimes with its own chandelier above it and special fur­niture around it,” Atisha said. Some people even have their cakes hanging from the ceiling! “One couple literally had their cake came out of the ceiling and drop down. Some people just love to add drama to their weddings,” she added. Average banquet hall chairs are be­ing replaced with special furniture to fit the wedding theme. They’re not just for the head table, but also for the guest tables and to create special lounging areas. “Bringing in furniture is like hav­ing a Miami chic look. Fancy leath­er, lounge furniture like chairs, love seats and sofas are being brought in with a cocktail table. They’re put­ting them on the dance floor and in the bar area for people to gather and enjoy,” explained Kallabat. 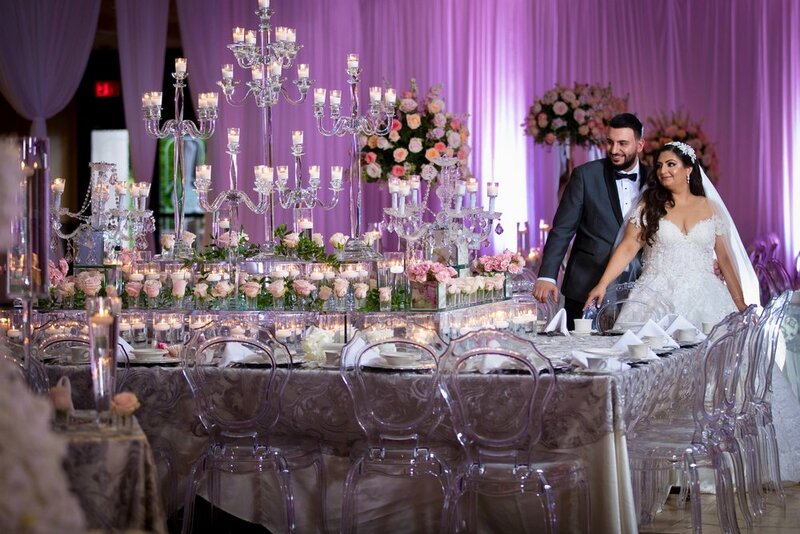 Since most Chaldean weddings are indoors, many couples are trying to bring the outdoors in for a natural, outdoor feel to their receptions. “People are beginning to incor­porate fruits in their floral arrange­ments such as pomegranates, lem­ons and plums for more of a festive, natural feel,” said Kallabat. Some couples are taking it to the other extreme with a non-tradition­al wedding venue and giving it an earthier, rustic theme. “They are taking warehouses and transforming them into a beautiful, rustic themed wedding. I’ve had a few clients take the blank slate of the shed at Eastern Market make it into a beautiful barn themed wed­ding. People are thinking out of the box,” Kallabat explained. Both Atisha and Kallabat warn that some of these trends can really break the bank. It’s about what’s im­portant to each couple to create a unique, customized and memorable big day.